Designed in collaboration with the U.S. Army Research, Development and Engineering Center for the U.S. Military Special Forces, the Micro Rappel system is a compact, lightweight escape set. The two-mode system converts from a belt to an emergency harness in seconds. 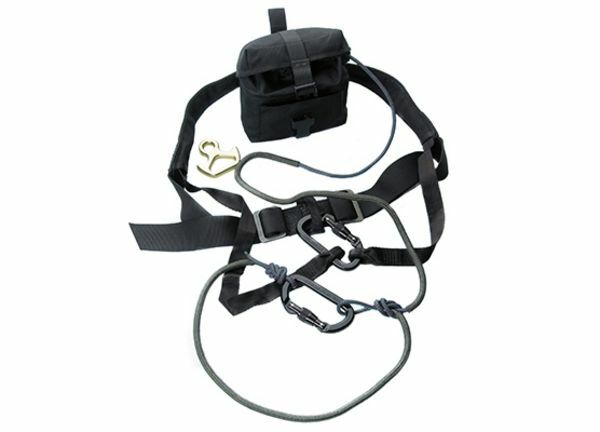 The Micro Rappel Kit can be transformed from a belt to lightweight emergency harness in no time. The system includes the rappel belt, a descender, two carabiners, deployment bag, usage log, instruction sheet, and 82 feet of our 5mm Tech Cord with a chafe guard. The leg straps for the harness are stowed in the belt. To deploy, the user simply pulls the leg loops out of the side pouches in the belt, pulls them down the front, in-between the legs, around the back of the leg, and back up. The leg loops and belay loop are then connected with a carabiner (included). The attached deployment bag holds the rope, carabiners, and descent device in an out of the way, compact package. The Micro Rappel kit provides a quick means of escape from any potentially volatile situation. While it is simple to use, its use does require special instruction and training. The Micro Rappel Kit is perfect for challenge courses, ski patrols and any other scenario in which staff may not be wearing harnesses but could be required to have one immediately without any notice or warning.